Three Brooklyn men who allegedly plotted to travel to Syria to join ISIS and posted online messages about planting a bomb on Coney Island and shooting police officers were taken into custody during FBI terror raids Wednesday, authorities said. The men, 24- and 30-year-old Uzbekistan citizens and a 19-year-old Kazakhstan citizen who all lived in Brooklyn, allegedly planned to return to New York to commit a domestic act of terror if they failed to join the group overseas, law enforcement officials said. The youngest man, identified in a criminal complaint as Akhror Saidakhmetov, allegedly posted on an Uzbek-language website in the last six months that he would buy a machine gun and shoot police officers and FBI agents if his plan to join ISIS was thwarted. In August, 24-year-old suspect Abdurasul Hasanofvich Juraboev posted on the board that he would kill President Obama if ISIS asked him to and asked for help getting weapons, according to the complaint. “This is real," the police commissioner said. "This is the concern about the lone wolf inspired to act without ever going to the Mideast -- or the concern of once they get to the Mideast, acquire fighting skills, capabilities and then attempting to return to the country." Lady Gaga to Star in "American Horror Story"
Court documents highlight the extent of the suspects' alleged intentions. 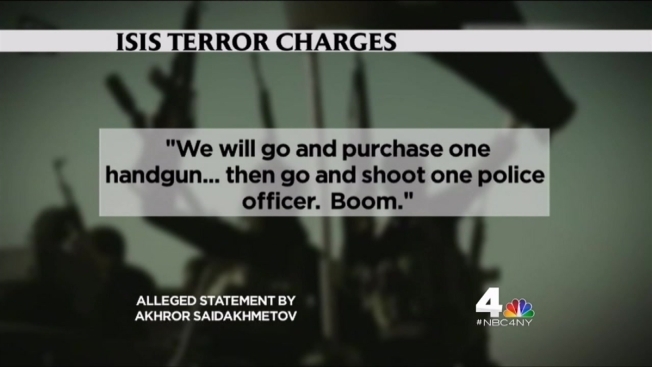 In a recorded conversation in January, Saidakhmetov told an FBI informant he would "just go and buy a machine gun, AK-47, go out and shoot all police," if he could not get travel documents to Syria, according to the complaint. "We will go and purchase one handgun ... then go and shoot one police officer. Boom ... Then, we will take his gun, bullets and a bulletproof vest ... then, we will do the same with a couple of others. Then we will go to the FBI headquarters, kill the FBI people," Saidakhmetov said, according to the complaint. Saidakhmetov was arrested early Wednesday at John F. Kennedy International Airport, where he was attempting to board a flight to Istanbul. Juraboev had already bought a plane ticket to Istanbul from New York and was scheduled to leave March 29. According to the complaint, the 30-year-old suspect Abror Habibov, operated a domestic support network that helped fund Saidakhmetov's efforts to join ISIS abroad. Habibov operates kiosks that sell kitchenware and repair mobile phones in retail malls in several states; he employed Saidakhmetov last fall and winter. Last week, Saidakhmetov called his mother to ask for his passport, and when she asked him where he was going, he said, "If a person has a chance to join Islamic State and does not go there, on judgment day he will be asked why, and that it is a sin to live in the land of infidels," according to the complaint. Around the same time, federal agents observed Saidakhmetov and Habibov arrive at a Coney Island Avenue travel agency. That was when Saidakhmetov bought the ticket to Istanbul. Frank Cakir, the travel agent who sold Saidakhmetov the ticket, said the 19-year-old seemed young, "like a kid, not even an adult." Cakir said the suspect spoke English well and seemed calm. He only spent five to 10 minutes in the travel agency and bought a ticket to Istanbul on Ukraine Airlines. Federal officials say Habibov waited outside for Saidakhmetov and the two left in a car together. Cakir said there was "nothing unusual about him." He said he was shocked to learn the young man was allegedly trying to join ISIS, and that his hands hadn't stopped shaking. Three Brooklyn men who allegedly plotted to travel to Syria to join ISIS and posted online messages about planting a bomb on Coney Island and shooting police officers were taken into custody during FBI terror raids Wednesday, authorities said. Neighbors say they wouldn't have guessed the men were suspected terrorists. Ida Siegal reports. All three suspects have been charged with conspiracy to provide material support to a terror group, officials said. Juraboev and Saidakhmetov appeared in Brooklyn court later Wednesday, and were each ordered held without bail, with U.S. Attorney Douglas Pravda arguing that the suspects "present a flight risk and pose a threat to the community." Habibov had an additional court appearance in Florida. If convicted, each man faces up to 15 years in prison. "We all take the threat of ISIS very seriously The vigilance levels that we maintain every day are our best shield," Mayor de Blasio said. "We are going to continue to deepen our anti-terrorism capacity. A lot of what we are trying to do is not only making sure we have the number of officers on anti-terror duty that we need, the training, the equipment, but that we are constantly deepening our relationship with communities all over the city so that there is a flow of information." The mayor referred questions about the Brooklyn investigation to the FBI. Such potential "lone wolf" threats as the ones mentioned in the purported January ISIS recording were a particular focus of a November NYPD counterterrorism conference, and Bratton said the department is investing more time and resources in monitoring extremist-influenced websites and social media. In September, federal authorities in upstate New York charged a Rochester-area man with terror-related charges after they say he alleged tried to buy guns to support ISIS and boasted about wanting to kill American soldiers. ISIS is notorious for using message boards and social media to lure recruits. Authorities are continuing to look for three missing London schoolgirls believed to have left home to join the terror group; authorities believe they have already crossed into Syria.